OEE is a simple performance measure for showing where the biggest time losses are during production. 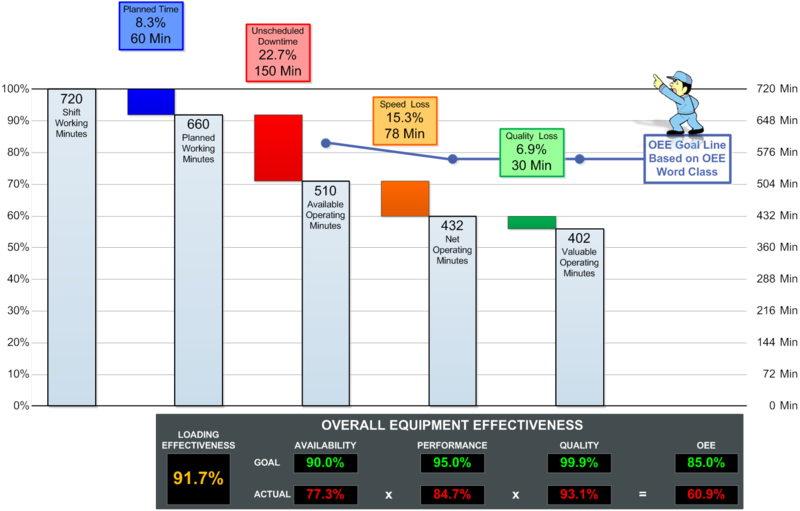 A few days ago I’ve posted an article about OEE and how to use it to analyze the six big losses and our overall efficiency (see Tentang OEE Overall Equipment Effectiveness). Now, I want to give you a sample problem and this is just sharing my own class exercise. What can we deduce from the calculated figures for each of these? The availability portion of the OEE equation measures the percentage of time the equipment or operation was running compared to the available time. In this case, our shift time was available to run 660 minutes but was only run for 510, then the availability is 77 percent (510/660). The 150 minutes when the operation didn’t run would be setup time and breakdown. The performance portion of the OEE equation measures the running speed of the operation compared to its maximum capability, often called the rated speed. In this case, we produced 864 kg during shift processes but the availability will allow us to produced 1020, then the performance is 85 percent (864/1020). The 15 percent of losses are usually separated into speed loss and minor stops. We found three times minor stops during shift time. In this case, time lost for a stop is not a breakdown because we can only record the quantity of stops with amount of time in average. The quality portion of the OEE equation measures the number of good parts produced compared to the total number of parts made. In this case, 864 kg are produced and 60 of them are scrap, the quality is 93 percent (864-60/864). An OEE score of 60% is fairly typical, but indicates there is substantial room for improvement. As you can see, the main problem is the availability. The focus of improvement is reducing excessive breakdown by increasing Preventive Maintenance (PM) or reducing setup time. This entry was posted on Jumat, September 30th, 2011 at 3:47 pm	and tagged with availability, maintenance, OEE, performance, PM, quality rate, TPM, World Class OEE and posted in TPM. You can follow any responses to this entry through the RSS 2.0 feed.